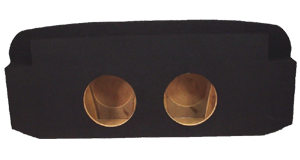 Our custom Cadillac subwoofer boxes have been custom designed and molded to fit specifically a variety of Cadillac cars and allow you to make the most of the space available in your vehicle. Find a huge range of custom enclosures customized to work with your Cadillac. Our boxes are constructed from high quality MDF wood. With a custom subwoofer box you will be taking advantage of all the space in your vehicle and at the same time enhancing your car audio system. These custom fit subwoofer enclosures will provide all the bass you need.